During a class, several riders of similar abilities work with a well-qualified Bright Horizons instructor. Classes include horsemanship skills and riding. 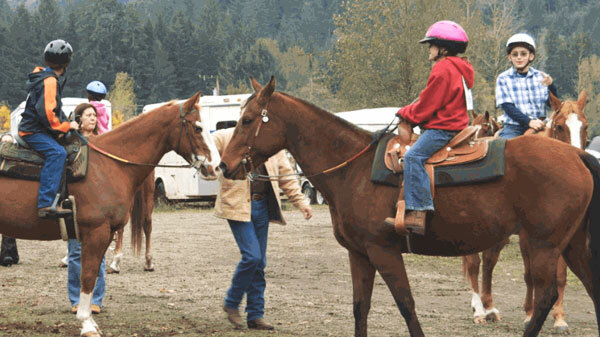 For special needs riders, instructors are assisted by trained volunteers that act as horse leaders and sidewalkers to ensure that each rider has a safe, productive and enjoyable experience. EFL/EFP sessions are conducted by appropriate mental health professionals and equine specialists. Sessions are structured in a variety of ways to ensure that each rider's learning goals and objectives are accommodated. Sessions incorporate a variety of ground-handling, mounted, and horse care-related activities. Additionally, sessions provide excellent opportunities to develop team skills and reinforce good sportsmanship behaviors. Spring, fall and winter sessions are typically ten weeks in duration and meet on a weekly basis. Classes can also be scheduled to accommodate specific schedules (minimum class size requirements apply). Bright Horizons has on occasion been able to provide full or partial scholarships to riders with special needs that might not otherwise be able to participate in our programs due to financial constraints. Scholarship availability and award criteria is determined on a case-by-case basis. If you or someone you know might be interested in sponsoring a Bright Horizons rider, we would love to hear from you! Press Release on Fall 2016 Classes - with descriptions of new classes!